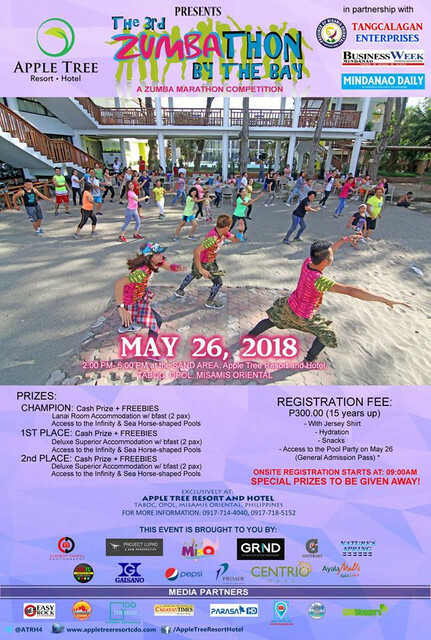 The Ultimate Summer Experience in Misamis Oriental is about to unfold as Apple Tree Resort and Hotel, the premier Resort and Hotel in the province in partnership with the Provincial Government of Misamis Oriental, Tangcalagan Enterprises, Business Week Mindanao, and Mindanao Daily News is bringing back the Endless Summer Beach Festival 2018 happening on May 25-27, 2018 at the Resort's Property. 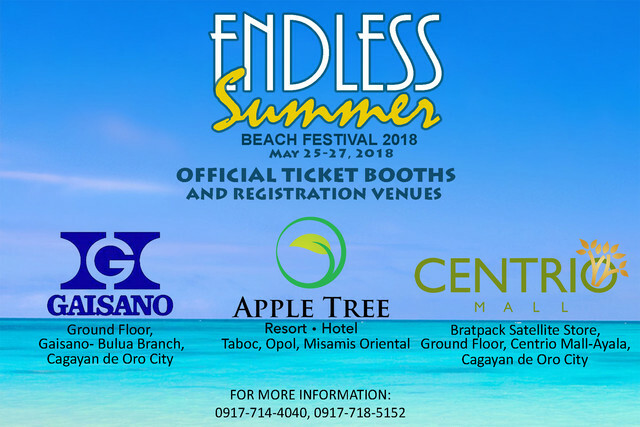 ENDLESS SUMMER Beach Festival now on its second season is a three-day summer event that will feature 6 different activities prepared for participants, and spectators-alike. Last year, Endless Summer Beach Festival 2017 made a successful impact to organize a full scale summer event in Northern Mindanao. 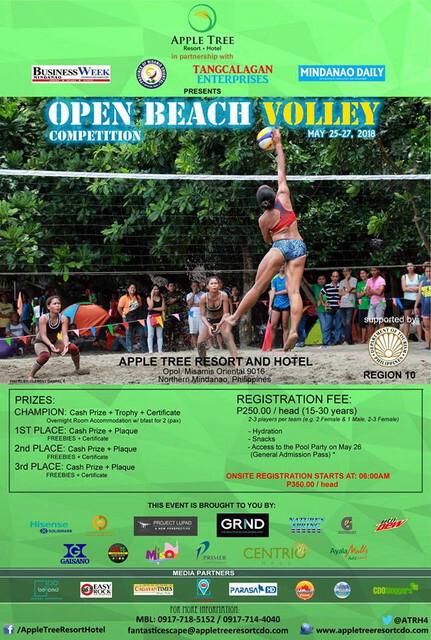 * Open Beach Volley Competition- Open for teams compose of 2-3 participants per team (1 male and 2 females, and/or 2-3 females) ages 15 to 30 years old. * 3rd Zumbathon By the Bay Competition- The third season of the event, Zumbathon By the Bay is a Zumba Dance Marathon ranging from 3 to 4 hours of zumba dances with the certified Zumba Instructors (ZIN). Exciting prizes awaits for the chosen winners! 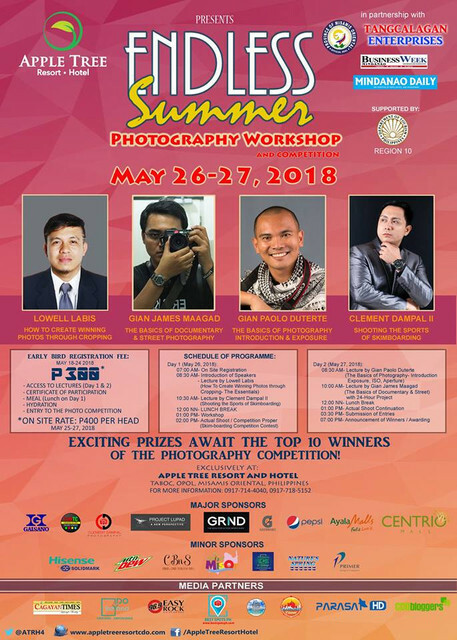 * Photography Workshop and Seminar- Now on its second season, this year's Photography Workshop and Seminar which will be on May 26-27, 2018 will feature 4 Speakers from different niches who will share their knowledge, and skills to the participants. This will be a two-day event with actual workshop, and a photo competition prepared with exciting prizes for the participants. * Fashion Show by CDOTC- An Active Sports Wear Fashion show by the Cagayan de Oro Talent Center (CDOTC) founded by Daddy Gabby Bacarro. The event is scheduled on May 27, 2018 (Sunday) at 05:00pm onward. * SHORE BREAKS 4- considered as the biggest skimboarding event in Northern Mindanao since 2016 a year after its introduction is now on its 4th year gathering enthusiasts, and professional-alike of the boardsports. It was officially endorsed by the Department of Tourism Region 10 as one of the sought-after events to look forward in Northern Mindanao. SHORE BREAKS 4 is one of the main highlights of the Endless Summer Beach Festival. 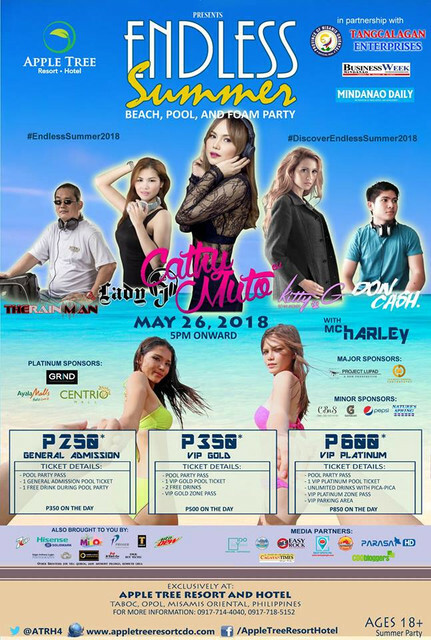 * Beach, Pool, and Foam Party- On the second night (May 26, 2018) of the 3-day event, the crowds will be tuned to a total unforgettable experience where participants dance to music by some of the biggest DJ names of the industry today that has proven to be masters of their own distinct styles to the property's Infinity, and Sea Horse-shaped Pools covered in several feet of bubbles, dispensed from a foam machine. * SKIM Clinic- Learn the basics of the boardsports from the Professional by joining the Skimboarding Clinic, a guided skim lesson for beginners at P150.00* for kids, and P200.00* for adults. Additionally, Endless Summer Beach Festival will entertain the crowds with a Reggae Night on its opening (May 25, 2018: Friday), and Acoustic Entertainment on the 3rd day (may 27, 2018 (Sunday). 1. GAISANO BULUA BRANCH- Ground Floor, Brgy. Bulua, Cagayan de Oro City. 2. CENTRIO MALL- Ground Floor, Bratpack Satellite Store, Cagayan de Oro City. 3. APPLE TREE RESORT AND HOTEL- Taboc, Opol, Misamis Oriental. - Inclusions: Pool Party Pass on Day 2, 1 Gen Ad Pool Ticket during Pool Party, 1 FREE Drink during Pool Party. - Inclusions: Pool Party Pass on Day 2, 1 VIP Gold Pool Ticket during Pool Party, 2 FREE Drinks during Pool Part, VIP Gold Zone Pass. - Inclusions: Pool Party Pass on Day 2, 1 VIP Platinum Pool Ticket during Pool Party, Unlimited drinks with pica pica, VIP Platinum Pass, VIP Parking Area. - Provincial Government of Misamis Oriental, Tangcalagan Enterprises, Business Week Mindanao, and Mindanao Daily News. - Tanduay, Primer Group of Companies, Camera Club of Cagayan de Oro, Mountain Dew, Shanghai Bakeshop. - Edgar Anthony Lugon, Ryan Balibay, Angelo Rodriguez Jr, Jon Vill Quirog, Jade Anthony Pilongo, Kenneth Chua. - Best Spots PH (www.bestspotsph.com), Parasat HD TV, Easy Rock 96.9 FM Station, Cagayan de Oro Times, Best Spots PH, CDO And Beyond, The Explorer's Channel, Eats Good To Be in CDO, and CDO Bloggers. There is always that one summer that changes you. What's your summer story?